Calling is a common tactic in waterfowl hunting. In fact, most duck hunters wouldn’t even attempt to hunt without their calls. But many deer hunters have never used a call. Some question their effectiveness while others are afraid of messing up the hunt with calls. Most don’t really know how to use them. The following information should help take the guesswork out of calling deer. The bleat call mimics the sound of a doe or fawn. Fawns often bleat when chasing looking for their mother. You may hear this sound in the woods during the rut when does abandon their fawns. If you’re targeting does, the bleat is an excellent call choice. They will often come to a bleat when looking for a lost fawn. But bleats are also great for calling in bucks. Estrous does will bleat when being chased by a buck. This sound can signal a doe in heat to competitive bucks in the area. Can calls are commonly used to make bleat sounds. They are very simple to use. Simply flip the can over to make a bleat. Try three or four bleats at a time every twenty to thirty minutes. ​The grunt is the most popular buck call. Bucks grunt when fighting, making scrapes & rubs, chasing does, or any other time they feel like it. Sometimes bucks can be seen grunting as they walk through the woods seemingly without purpose. A buck grunt is usually an isolated sound. However, when chasing hot does they will often grunt continuously. A grunt call is most effective when a buck is in sight but out of bow range. The grunt is a challenge and he will often investigate what made the sound. One mistake hunters make is grunting when the buck is looking toward you. This is a good way to get spotted, even if you’re high in a tree. Grunt tubes are a popular choice for beginning deer callers. Blow a one or two note call every twenty to thirty minutes. I’ve found grunts to be most effective during pre-rut. ​Rattling is a common tactic used to mimic a buck fight. You can use real antlers, rattle bags, or factory produced antlers. A lot of people think they need to sound like a slug fest when rattling. Often all you need is just a few crashes. Young bucks often spar without really getting into it. These sparring matches can attract bigger bucks that want to show the little guys who the real boss is. If you recreate a heavyweight match, your chances of bringing deer in will drop since many younger bucks won’t want any part of a big fight. I’ll often just make a few quick rattles when I see a buck moving away from my stand site. Again, don’t rattle if the buck is looking at you. Grab your bow as soon as possible after making a few rattles at a deer that is in sight. They will literally run to the rattle if the mood hits them right. Rattling can work all season long, but I like to rattle early in the season right up to rut. By the time rut hits the pecking order is established and bucks begin mating. Rattle when spotting a deer moving away from you or once an hour to attract the attention of distant or unseen bucks. Mixing in a few grunts while rattling adds realism. 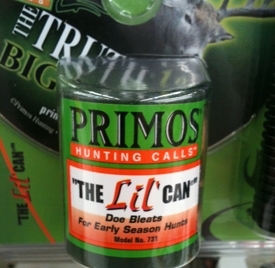 ​Also known as the snort wheeze, this call is very effective on big, mature bucks. The wheeze is the ultimate in dominance calls. Bucks use it when trying to intimidate smaller, subordinate bucks. If you’re calling to smaller bucks, stay away from this one. Young bucks that are wheezed at will often run for safety. However, dominant bucks frequently answer the challenge by strutting toward the call. The great thing about a wheeze is you won’t need to buy a call. You can make this sound by quickly breathing in with your teeth clenched and your lips barely open. Then quickly exhale out with your mouth in the same position. I recommend reserving this call for when a big buck is traveling away from you. It won’t work all the time and if you try it before spotting a deer, you will often spook off younger bucks. Calling deer doesn’t have to be a mystery. Like anything else in hunting, there are no guarantees. However, used correctly and used sparingly, deer calls can be another helpful tool in your deer hunting arsenal.